Our company is coveted in the domain of manufacturing, supplying and exporting of Rust Converter Chemicals such as Rust Converter Chemicals. These rust converter chemicals are available in various technical specifications and are manufactured at par with the set industry standards. Polymer is the chief constituent of these rust converter chemicals. As their name implies, these chemicals have the capacity to convert the rust into organo metallic complex. Our company specializes in manufacturing, supplying and exporting an excellent quality range of Rust Converter. This is also known as Elasto Rust Conguard (ERC), which is high in performance. Moreover, water base, coordination polymer is used for rust conversion and it also protects metal from rust. 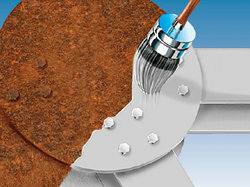 In actual fact, it converts the rust as well as protects the surface of metal also. Our range efficiently works by converting the rust into an organo metallic complex that is protected by a polymer. Besides, when buff colored ERC has been applied corroded surface, it further converts the color of rust into black, grey or brown film within a minute. This marks the rusting end of the metallic surface. Looking for Rust Converter ?